One new thing I discovered in my research in preparation for the panel was that there has been some division within the Presbyterian tradition over how to line up the offices of leadership with the words for leaders in the New Testament. I have always understood that the “elders” of the New Testament were the same as in the Presbyterian church, and that pastors were considered to be elders whose special function was teaching and preaching, as 1Timothy 5:17 says. I was surprised to learn that Calvin did not see it that way. As said above, he named four offices: pastor, teacher, elder and deacon. 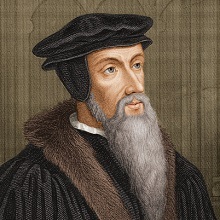 Calvin connects the New Testament “elder” with his idea of pastor. He recognizes that there is a great interchangeability in the words for leaders, and especially notes that “bishop” and “elder” are identical. But he equates that office with pastors. His office of Elder he connects with the Biblical word “governor” in Romans 12. The word, “elder”, of course, at its simplest means older person, presumably experienced and wise. It’s not specifically a title. And Calvin seems to take it that way. So some strands of Presbyterian tradition link the Biblical “elder” with our current elder. And some do not. This seems to me to question the whole distinction we, in the PC(USA) are now making in our own denomination, seeing pastors and elders both as teaching elders and ruling elders respectively. Calvin did not agree with that distinction, seeing pastors and elders as two separate offices, as two types of one office. That’s just the words though. In function the Presbyterian tradition is clear and consistent. Elders and Pastors lead the church together. To shift the focus of this post, I will give three reasons why I think this practice is a good thing. First, as best as I can tell, it is Biblical. As I already mentioned, it is not easy to read the New Testament and determine how the early church was structured. This is probably because it was not clearly structured yet. That would come later. It is also because we are really only able to over-see or over-hear how the ran the church in the pages of the New Testament. It is not something that is directly addressed beyond Paul’s qualification lists for elders and deacons in 1 Timothy and Titus. But what does seem clear is that the church in any given city or town was governed by a group of elders, sometimes called bishops, and they were the decisive leaders in that church. The best view we have of church government in action is in Acts 15, the so-called Jerusalem Council, when the church decided what to do about God bringing in Gentiles into what was up to that point a Jewish sect. I often teach this passage in classes about church government. I ask the question after reading the passage, “Who makes the decision?” I realize that one’s own church background may strongly influence one’s answer to that question, but I see the decision decisively being made after the apostles and the elders agree. It’s not Peter, or James, or the people as a whole, but this representative group that decides the matter. Since the office of apostle, according to the Biblical definition of an apostle as one who has learned the Gospel directly from Jesus (see Acts 1:21-22 and Galatians 1:11-12), ended with the Apostles themselves, that leaves elders, which, unlike Calvin, I understand to refer to leaders who were not, but may include pastors. Secondly, you can’t trust power further than you can throw it. A hallmark belief in the Reformed tradition is the total depravity of man. I remember my seminary professors pointing out that total depravity does not mean people are totally awful, but rather that it means that every area of our lives are touched and twisted by sin. This is true of our use of power. Left to his own devices, it is only a matter of time before a person with power, like a pastor or priest, will use his power for his own purposes. Spreading out that power, in the church among a group of leaders, or in a nation a separation of powers, minimizes the chances of such an abuse of power. Finally, shared leadership is a demonstration and living-out of the communal aspect of our faith. As Paul makes a point of emphasizing, Jesus is the head of the Church. The rest of us are, together, the body. And we all need to be in it and connected to one another. Jesus is the head. There is no room for another. This entry was posted in Regular Posts and tagged Church, elders, John Calvin, Leadership, pastors on March 28, 2014 by revkamcclain.